UNLAZDEP: OVERCOMING LAZINESS AND DEPRESSION! Have you ever felt that sleeping was your main activity, that starting a new activity would make you spend a lot of time to force yourself to do something, that everything is completely uninteresting for you, have you ever thought that life is meaningless? Have you ever felt that you are tired of everything and that too many problems have fallen on your head? It will be a huge problem to remain in this state of mind. Life will seem to be too long and the benefit of it on a scale from 0 to 10 will be close to zero, all your actions will be performed on an automated level, you will cease to receive joy, turn into a robot and, sadly, it will turn out that the next destination of your life will be death. and a casual smile will become your everyday accessory. 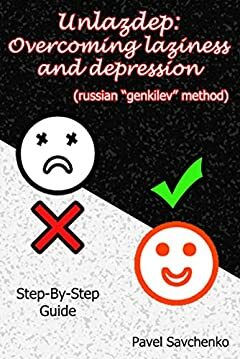 Tests have shown that people, who followed provided steps in this book, have increased their energy levels, improved their mood, people have started to work faster and they have improved their mental state.